My colleague, a size 0 lovely, sits behind me at work and eats leaves on a regular basis? So finally this weekend, I cooked a child friendly, low fat, moist but curry free Indian dish to lure her into the big bad world of Indian cooking (as if!!). This dish is my take on the traditional Chicken Jalfrezi, a moist stir fry with onions and green peppers/capsicums. 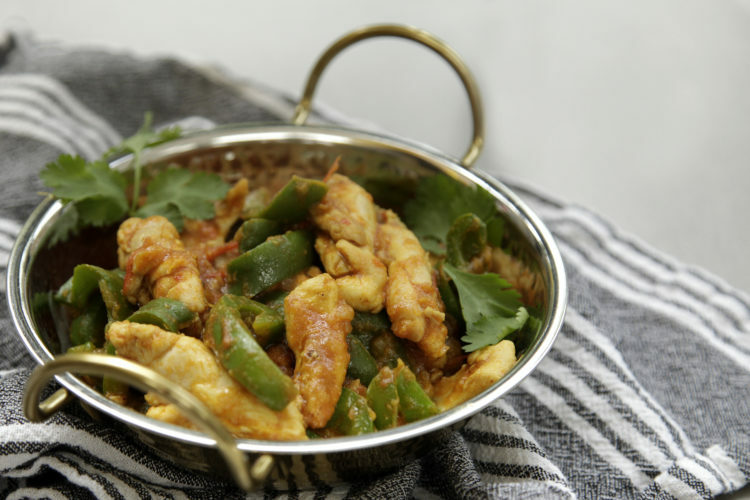 My version of Chicken Jalfrezi is supremely salad friendly, as tried and tested by myself, and doesn’t infiltrate the kitchen with heady aromas like many of its richer counterparts. I served it with a bag of watercress, rocket and spinach salad because of its peppery taste that complements Indian food so well. Mix the yoghurt, turmeric, chilli and lemon juice with the chicken strips and leave to marinate. This tenderises and flavours the chicken. In the meantime, slice thinly the onion, tomato, green pepper and finely chop the garlic and ginger. In a frying pan, heat the oil on high. When hot, fry the onions, garlic and ginger. The onions should start turning translucent and soft. Add the chicken with its marinade and stir on high for five minutes. Stir in the tomato and keep frying on a hight heat until it the chicken is almost cooked. Then add the green peppers and garam masala, cover the pan and stir once or twice until the peppers soften. The dish is ready when the gravy dries up and the peppers are limp. Add salt and coriander leaves to finish. Jalfrezi looks beautiful on a bed of salad..YUM!! And did SOBB bite the bait? Diwali was great, but a bit quiet. Hope it was brilliant for you? Do you’ve any? Please allow me recognize in order that I could subscribe. Thanks.